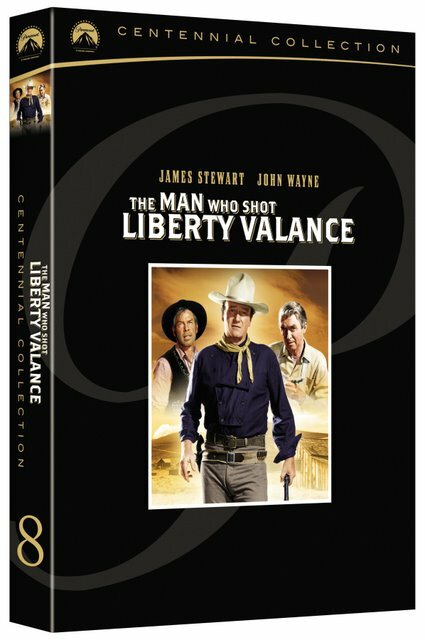 As the saying goes, “John Ford Made Westerns,” and it’s his four decades of doing so with The Duke that provide one of the most fascinating selections of titles for film students or ardent fans of the genre to peruse. 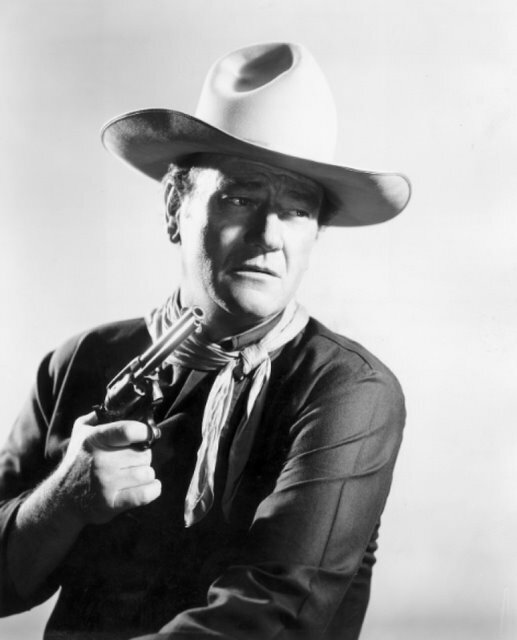 To a casual viewer, Duke’s persona was always that of the same uncomplicated and genuine cowboy who said “pilgrim” an awful lot (when in reality the first time this occurred was in this picture), sat tall in the saddle, and never let a wicked gunslinger get away. However, it’s in his pictures with Ford that you can most specifically see the way that Duke’s characterization—as an extension of Ford’s attitudes regarding politics and what was happening in American society at the time—evolved over the course of their work. 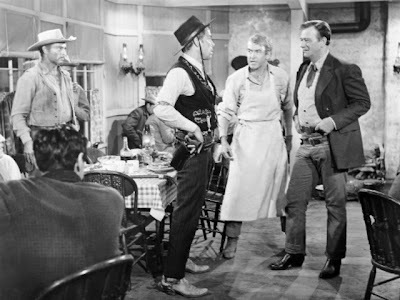 From the do-gooder subtext in Ford’s earliest work with Wayne — it wasn’t until Ford saw the man in Howard Hawks’ excellent Red River that he realized the potential his star had as an actor and he adjusted their collaborations accordingly. 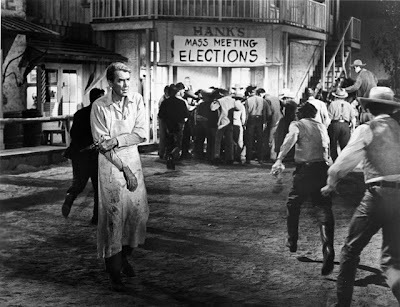 And beginning in the post World War II era, the films started to become much darker as the years passed which was witnessed in the revered, violent classic The Searchers until their final feature together, The Man Who Shot Liberty Valance was released in 1962 and managed to present Ford’s entire thesis in one perfect 123 minute unforgettable collection of unspooled reels of celluloid. 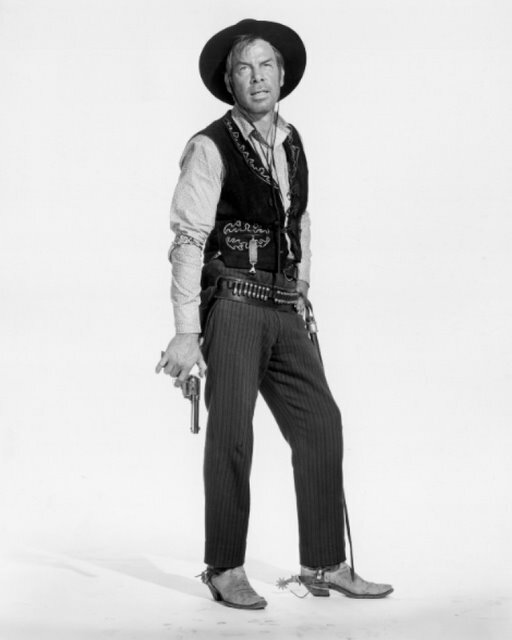 In fact, the irony is used throughout the entire work which was shot in black and white for what can be attributed to dozens of reasons — the aging stars playing characters far younger than they were, the cost of the film which could’ve only been green-lit by Wayne locked into an ultra-successful 10 picture deal with Paramount, etc. However the entire point of the film goes against the visual representation in its stance that absolutely nothing is black and white. 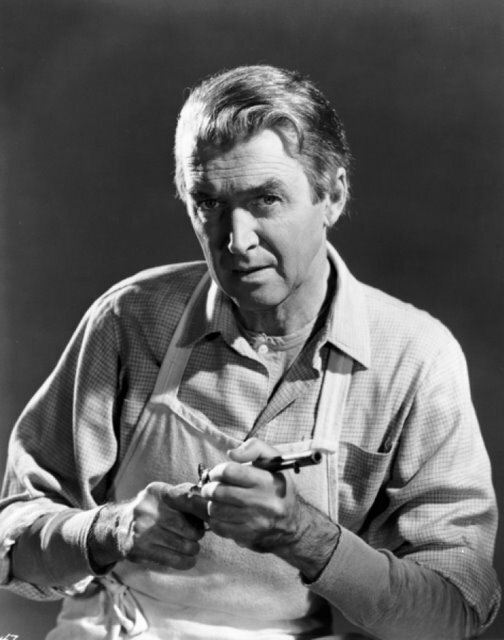 A movie without clear-cut heroes, Ford does present us with one incredibly vicious villain in Lee Marvin’s most sadistic turn as the whip carrying Liberty Valance, but it goes even further in its opposition to the typical western paradigm — even the names are ironic as Jimmy Stewart’s character whom we initially assume is our naïve hero is named Ransom whereas the villain is Liberty. 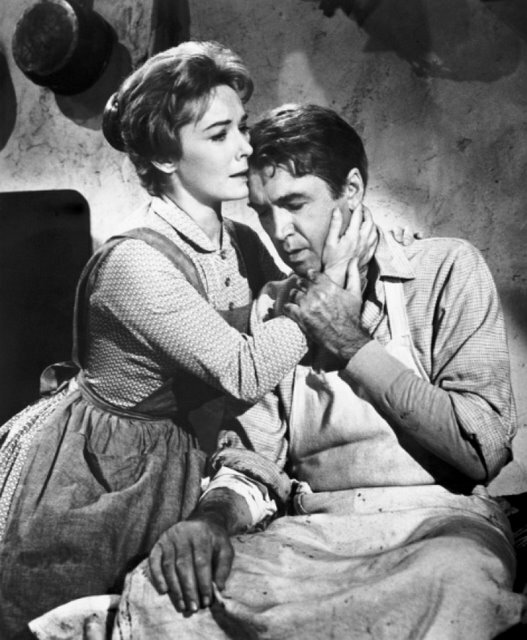 Based on Dorothy Johnson’s short story but given a decidedly different spin as— unlike Johnson’s presentation of what would become the Wayne character as a near “fairy godmother” who nudged Stewart’s Ransom Stoddard along and showed him the way— Wayne sees him as a romantic rival for the heart of the sweet, illiterate Hallie (Vera Miles). Opening the film as Ransom and Hallie step off the train back in the old town of Shinbone for the funeral of Duke’s forgotten rancher Tom Doniphon, Ford and screenwriters James Warner Bellah and Willis Goldbeck already ruin the surprise of who gets the girl right from the start by introducing us to the now extremely successful couple as we discover that Ransom has gone onto become a beloved senator. 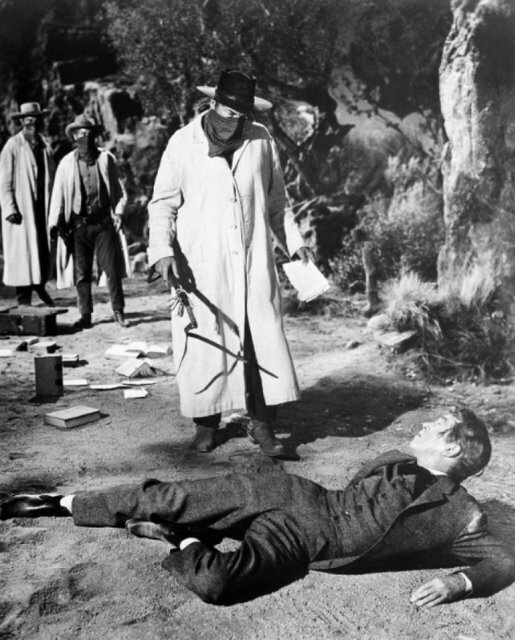 A legend back in Shinbone for having killed the notorious Liberty Valance, the structure of the film bravely works against the over-used device of the flashback in an extended one as Senator Stoddard finally decides that it’s time to tell the story of his arrival in Shinbone and what really happened regarding Marvin’s crazed outlaw and his death. Obviously, the revelation is one that’s fairly easy to predict and moreover it's one that intriguingly Variety in their 1962 review of the film notes may have worked more successfully if the narrative hadn’t given away these “current day” surprises from the start. However I still feel it’s Ford and Wayne’s best feature. The most clear-cut and perfectly executed example of the themes that had been woven throughout the filmmaker’s career, in the end Valance still stands as a work that begs to be discussed once the final frame flickers and it cuts to black. Above all, it concerns itself with the difference between “legend” and “fact” and Ford’s assertion that relying squarely on books, law school, and intellect is fine in theory but in the end you have to be willing to understand that sometimes force is required to fight for what’s right. 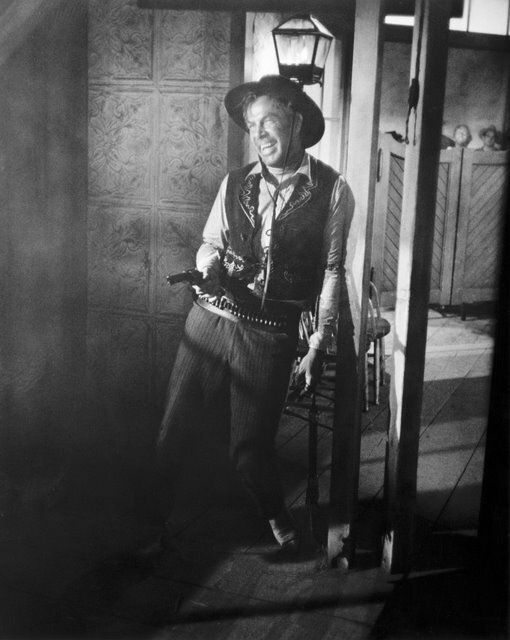 And in the film, we’re introduced to Stoddard’s arrival as a law school graduate who decided to literally “go west young man” only to find himself nearly killed upon his arrival by Marvin’s grinning psychopath. While Stoddard refuses to let others fight his battles for him and tries to get law and then the newspaper on his side before he helps educate the townsfolk and rally them in the quest for statehood, the tough minded Doniphon isn’t content to let Valance walk all over Stoddard as well as the rest of the town. Realizing he’s losing his unspoken but—on his end—understood “claim” that Hallie is his girl when she finds Stoddard's willingness to have stood up to Valance on behalf of an old woman brave, we watch as Duke’s heart slowly breaks and understand when he makes a decision to act to ensure her happiness even if it will cost him his own. 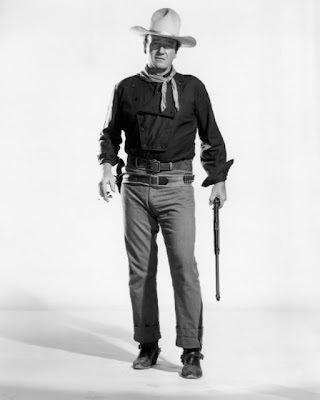 However, it’s still Wayne, therefore Ford refuses to turn him or anyone into a teddy bear as despite himself, some of Doniphon's actions as well as Stoddard’s go against the two men’s “types” brilliantly in the eyes of filmgoers who felt they knew everything about Stewart and Wayne based on the roles they’d played in the past. While Miles admittedly doesn’t have all that much to work with since after all she’s a woman in a western, it’s especially surprising to watch again this time around. For although it’s the legend of Doniphon’s actions and Wayne’s picture that is used in the foreground of the box and most of the film’s advertising, in reality he has the least to do in the movie as Marvin easily dominates the picture and Stewart undergoes a complex and staggering evolution all in the course of one movie as opposed to the Duke’s with Ford over four decades. Also elevating the work are Woody Strode as Doniphon’s devoted sidekick Pompey and especially Edmond O’Brien’s dignified turn as a never-say-die newspaper man Dutton Peabody, who gets the chance to shine in the film’s most exquisite cinematographic shot as he turns off his lamp and crosses the street before returning — illuminating it once more to find Valance and his goons are there. 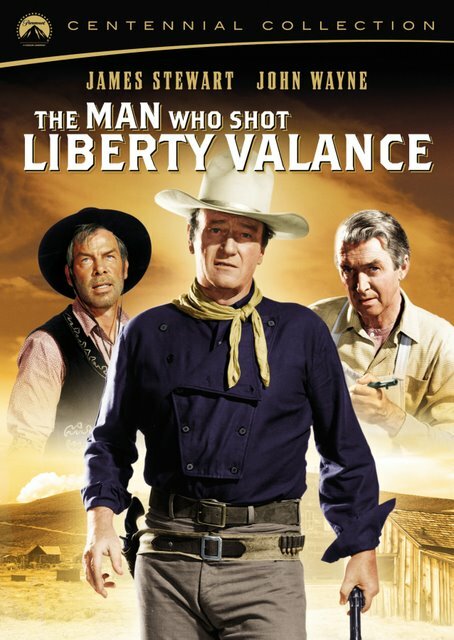 An American classic, Valance is one of the most surprising westerns ever offered by the genre and one that I guarantee will interest even those who wouldn’t necessarily categorize themselves as “western fans.” Ford’s influence in using filmmaking cleverly to remind viewers that life is far more complicated than a cowboy in a white hat and one in a black hat (despite its tongue-in-cheek usage of this same imagery with Wayne vs. Marvin) makes The Man Who Shot Liberty Valance an ideal choice for Paramount’s Centennial Collection. The edition features dual commentary tracks, including a feature length one with Peter Bogdanovich that contains archived interview recordings with Ford and Stewart as well as a selected scene audio track introduced by Dan Ford also containing archival recordings of Ford, Stewart, and Marvin. The set's second disc also contains the original trailer, galleries as well as a seven part featurette entitled “The Size of Legends." Hands down, a terrific buy for Father's Day, this collection is sure to be of interest to those who cherish the picture and/or the talented individuals involved.